A brightly colored <a href="https://inhabitat.com/plans-for-apples-new-headquarters-in-cupertino-approved-new-images-released/" target="_blank">spaceship-shaped</a> cabin just popped up inside the stone walls of France’s <a href="http://fr.wikipedia.org/wiki/Château_de_Malbrouck" target="_blank">Chateau Malbrouck Manderen</a>. Designed by French design group <a href="http://www.lesetablissementstourneux.fr/astronef/" target="_blank">Lesétablissements Tourneux</a>, the <a href="https://inhabitat.com/nyc/silohome-cold-war-era-missile-silo-transformed-into-luxurious-underground-house-in-upstate-new-york/" target="_blank">torpedo-shaped cabin</a> is made from plywood, straps, rope and mirrors and it was easily assembled by hand on-site. 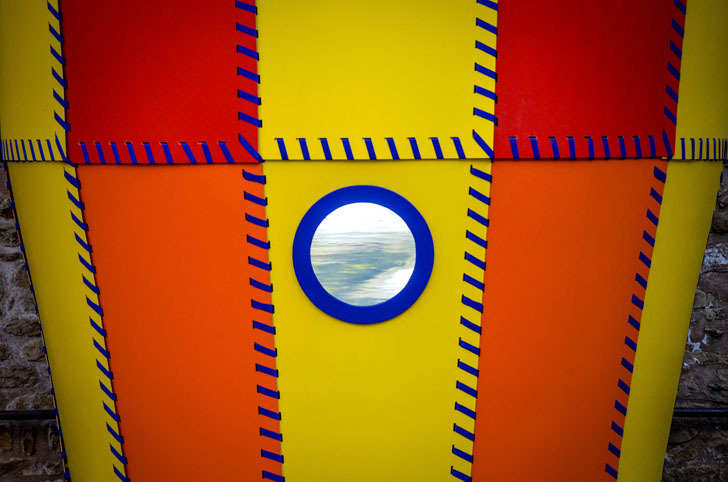 The bold red, yellow and orange cabin fuses fantasy with reality, creating a rocket-like play house for visitors to the castle. 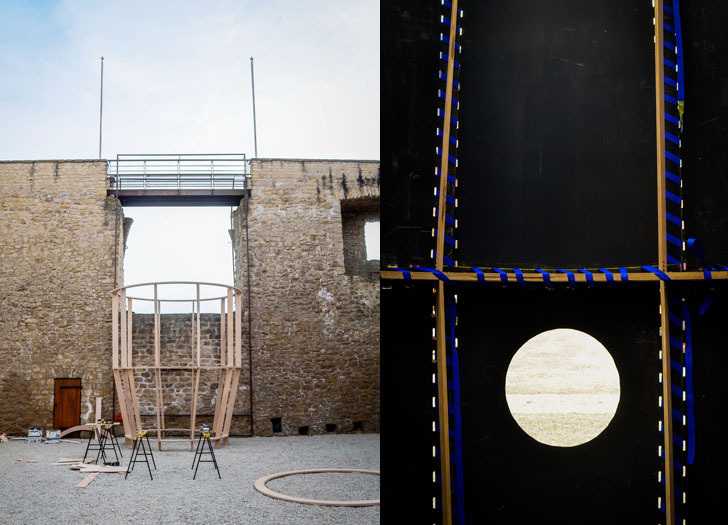 Tourneux’s structure hugs the stone walls of the <a href="https://inhabitat.com/mathieu-lehanneurs-modern-led-chandelier-weaves-through-the-ceiling-of-a-historic-chateau/" target="_blank">historic castle</a>, which was built in the northern of Moselle from 1419 to 1434. 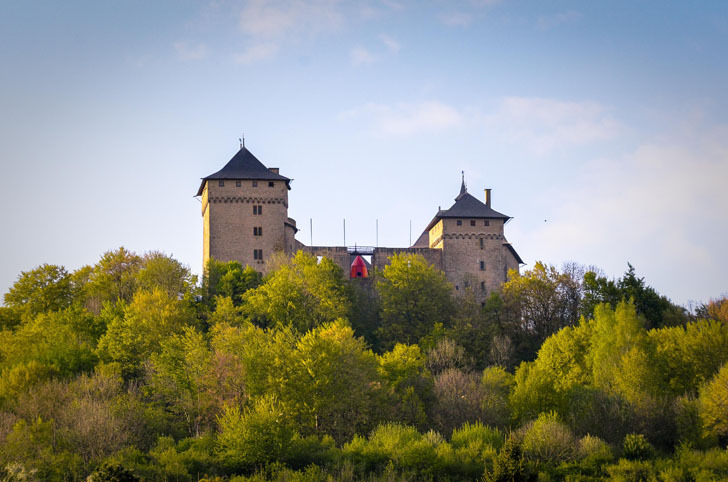 The castle opened to the public in 1998, creating a series of festivals and exhibitions as part of their repertoire. 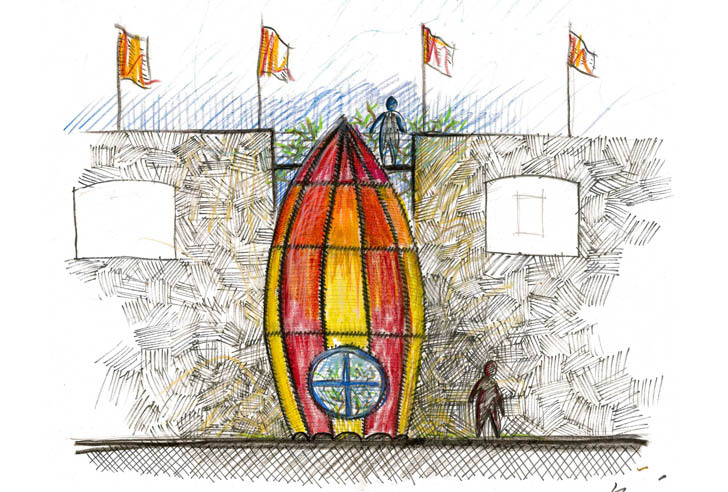 For this year’s program dedicated to the art of game and toy, Tourneux was asked to design a fantastical structure that would evoke children’s stories, while also creating a place to watch the horizon from the castle. 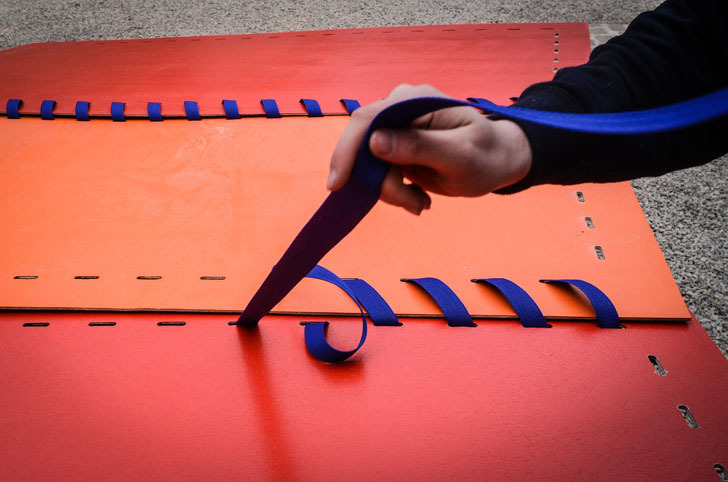 Much like a child’s fort, the spaceship structure was strung together using sturdy ropes and straps, woven through perforations on brightly painted plywood pieces. 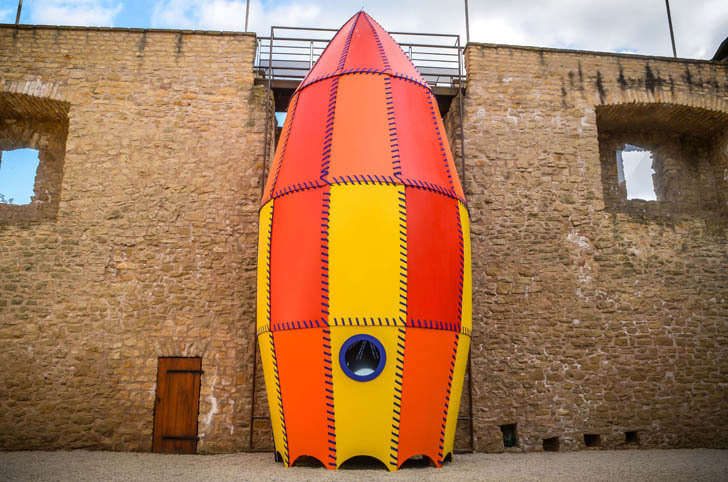 Culminating to a point at the top, the piece was designed to look like a rocket from a vintage children’s book, appealing to both kids and adults alike.Inside, two portholes boast mirrored windows that gives a view of the horizon beyond the castle. The beautifully whimsical structure spurs the imagination and acts as both fort and vessel, inspiring the young minds who visit Malbrouck Manderen. 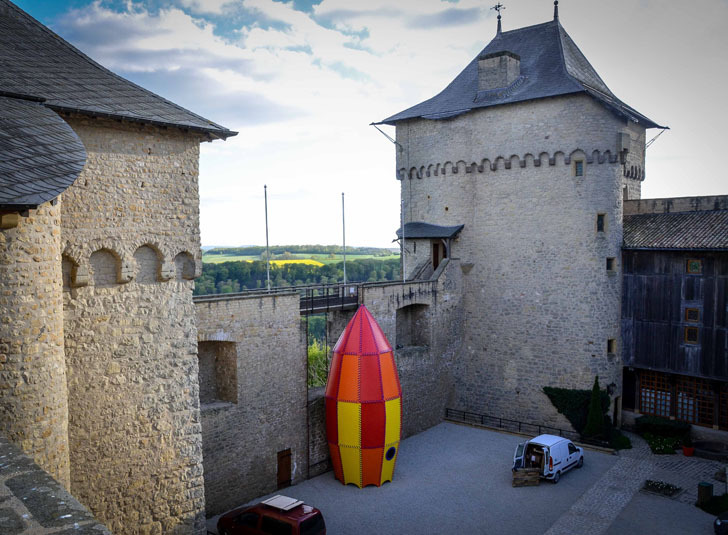 A brightly colored spaceship-shaped cabin just popped up inside the stone walls of France’s Chateau Malbrouck Manderen. Designed by French design group Lesétablissements Tourneux, the torpedo-shaped cabin is made from plywood, straps, rope and mirrors and it was easily assembled by hand on-site. The bold red, yellow and orange cabin fuses fantasy with reality, creating a rocket-like play house for visitors to the castle.